The level of participation reflected how politically active Thais have become. Nuseela Doloh of Pattani province refused to miss out on the voting even on her wedding day. The smiling bride-to-be was chauffeured on the back of a relative’s motorcycle to and from a polling station dressed in her wedding gown. Two men in Saraburi province also marked their ballots while wearing white gowns. Nantawat Sukkasem and Wirach Deenikom cast their votes early because they were to be ordained as monks a few hours later. The Election Commission (EC) estimated voter turnout at about 65.9 per cent. More than 51 million Thais were eligible to vote. Many took advantage of advance polling last weekend, but Election Day yesterday was busier by far. “I am so excited and so glad to see so many people turning out,” 18-year-old Wanida Maseng said as she registered to vote at a polling station in Narathiwat. Elderly citizens matched young first-time voters in their eagerness to play a role in the exercise. They came with walking sticks, in wheelchairs and as committed as any spry patriot. At age 102, Naiphan Banlueharn could have been their spokesman. “Being old doesn’t mean we shouldn’t come out to vote,” said the Yasothon resident, who was at the polling station with his 98-year-old wife and their three children, also of advancing years. The first voter to show up at a station in Bangkok’s Chatuchak district was a 92-year-old woman. Elderly voters at a polling station in the capital’s Bang Sue district had offers of help from a half-Thai, half-German schoolboy. Speaking fluent Thai, he helped flag down taxis for them as they left. Amuk sae Tang arrived at his voting station in Yala in a wheelchair. “I have difficulty walking around so I asked my son to get me a wheelchair to come and vote,” he said as he registered for a ballot. Polling officials in Chiang Mai helped hilltribe people in their own dialects to understand the balloting. “I am a Thai citizen, so I feel I have the duty to vote,” said Mayuree Janthima, 58, from Doi Pui. The 92,320 polling stations across the country were open from 8am to 5pm. Political heavyweights and entertainment figures turned heads as they joined queues to vote. Prachachart Party leader Wan Muhamad Noor Matha marked his ballot in Yala, Jongchai Thiangtham of Bhumjaithai in Suphan Buri’s Sri Prachan district, and veteran Democrat figure Siriwan “Mae Liang Tik” Prasjaksattru in Phrae’s Rong Kwang district. Chaiya Mitrachai, a star of likay, the traditional Thai opera, registered his vote in Angthong, and movie star Urasaya “Yaya” Sperbund did the same in her hometown, Pattaya. The way everything was weighted so heavily, to the advantage of the future PM (a.k.a. coup leader), it can hardly be called a 'resounding vote for democracy' ! "...A resounding vote for democracy..."
Er... Ahem... Oh... Not quite. "...The Election Commission (EC) estimated voter turnout at about 65.9 per cent..."
In 2011, it was about 75%. A "Resounding Vote for Democracy" would have seen that number go up, not down by 10%. A resounding vote for flushing democracy down the toilet. I wake up this morning and find myself still living in a banana republic run by a tinpot dictator. My wife is gutted and ashamed of her country. She doesn't know of one person that voted for El Presidente and finds it beyond belief that anyone voted for him. No wonder the "government" went to such lengths to keep independent observers away from the election. Pure sham. David Copperfield would have been proud of the show. democracy in all its hypocrisy. It’s rather incredulous that the junta managed to win, thus saving the embarrassment of having to perform another coup. So the current Government will be in power legitimized by an election. What changes do you think will follow that will benefits retirees and perpetual tourists? Big Joke secured his promotion to Police chief's role in the next five years. 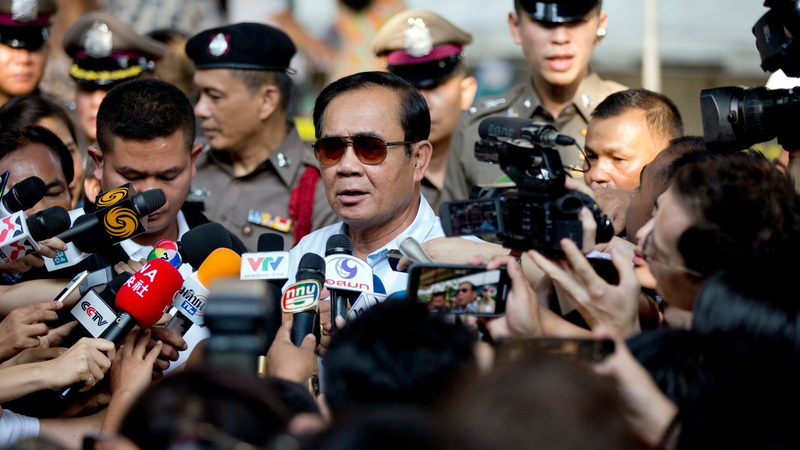 Is he continue to crackdown on tourists who make Thailand home? Is he going to push for health insurance that will be the last nails on coffin for retirees. Is he going for increasing the financial requirements for retirees in coming years? How he is going to ensure What immigration polices he will advocate? If I am correct, Thailand's political parties are mostly divided in three groups. The urban middle class, the rural poor, and the military elites. Is he going to push for health insurance that will be the last nails on coffin for retirees. Is he going for increasing the financial requirements for retirees in coming years? How he is going to ensure Thailand's economic growth when export is drastically down and consumer spending is almost flat? I think that the plight of expat perennial whingers is the least of Thailand's worries now. Democracy - the meaning of the word is not known in this country! A rigged vote and not to mention vote buying (and not by Taksin's lot) was alive and well in this province (only three hours from Bangkok! Funniest headline this site has ever had. You beat me to it. 65% turnout and a distinctly undemocratic feel to the whole election. And there we have it; what The Nation deems news! True, but this mob are the worst thing that could have happened for Thailand's expat community.